Description: Sexes similar. 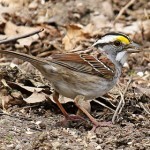 Bright white, strongly outlined throat; black crown stripes and eye line; and yellow lores. 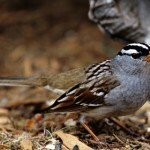 Some birds have white eyebrow and central crown stripes, while others have tan eyebrow stripe and grayish central crown stripe. Bill is mostly dark, never pink as in White-crowned Sparrow. Rusty-brown above; grayish below, sometimes with diffuse streaking. Juvenile has grayish eyebrow and throat, and heavily streaked breast and sides. Habitat: Migrants are found in woodland edges, thickets, weedy fields, and sheltered areas near water. Occasionally seen at feeding stations during the winter. 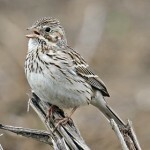 Where in Nebraska: Common spring and fall migrant in eastern Nebraska, becoming uncommon to rare in the west. Locally common winter visitor. Field Notes: Usually found on the ground. Mixes with other sparrow during fall and winter. 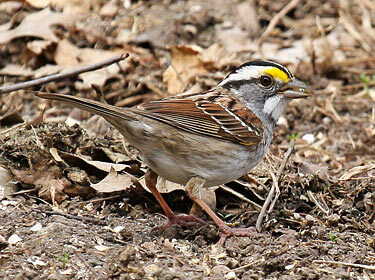 Fun Facts: White-throated Sparrows nest on or near the ground, but if the nest is predated the parents will attempt a second nest up to 15 feet off the ground in a tree.